Batman: Arkham City was on sale for half price. Of course we bought it! And then we ran home and I put on my Batman pajamas and set to work. 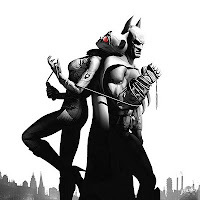 Unfortunately, having not played Batman: Arkham Asylum, I really didn't know what to expect. Or rather, I just figured I'd have the Dark Knight prancing and gliding through the city, beating on things. Turns out, there's a wee bit more to the game than that and Batman is mad at me for thinking otherwise. I resisted the urge to play this on easy - mostly because the description for the easy level implied that I probably shouldn't be playing this if I was going to waste Batman's time on easy mode. In retrospect, I should have taken that as a sign of things to come. Fortunately, I was able to call upon my old Mortal Kombat skills and, after a few challenge practices, I understood how to triangle triangle L X X square triangle R2 my way through large group battles. I'm not so good with the stealthy, but again, using the challenges helps. So does having my kids near by, quietly colouring or playing. "You keep dying, mommy. Maybe you should just quit." "Shut up! I'm teaching you about perseverance!" One might question our decision to let our kids watch as we play such games, but we'd rather desensitize them to violence and war in our loving presence instead of hiding our habits from them and letting them discover such things in less wholesome environments. Speaking of wholesome environments, let's go over the concept of this game. As if Gotham City weren't enough of a rotting cesspool, we've added an entire city within it, to house its criminals. Apparently, the city got tired of Batman's open back door policy at Arkham, and decided to just let everyone loose in the middle of Gotham. Don't worry. I'm sure none of them will get out. Let's just ignore that complete logic fail, and continue with our mission. Only, no one will let me do my mission! Every time I try to find Mr. Freeze, some political idiot gets himself in trouble. Or Bane asks for favours. Or frak you and your frakking phones, Zsasz!!!!! And then there's the Riddler. Stupid question marks all over the city, demanding my attention just so they can make me feel intellectually inferior. My Mortal Kombat training may have kicked in, but I probably should have paid greater attention in my Mode 2/3 classes. There has been much yelling at the television screen. In any event, what I really wanted to say was EMPATHY FOR BUTTON SMASHING. I play ALL games on casual because that's how I roll and I'm mostly in it for the fun stories and running around worlds finding amusing glitches. Also - I read 2 minute Justice League: LOL indeed! I hope you keep it up - I want more! LOL You can't play this on easy because the description for that mode makes you feel like baby Batmans are crying. Apparently, storywise, this one isn't quite as good as the first. But playing this without having played the first, I don't feel like I'm hurt by it.